Are you putting yourself at risk? How likely are you to suffer an injury from patient-handling duties associated with colonoscopy? Our two-minute, customized endoscopy injury risk assessment will help you answer this question. 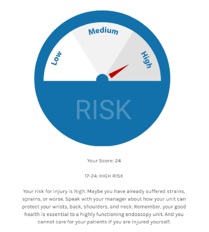 You will receive your own personal injury risk score with recommendations for staying safe.